apartments on the left and the entry gate on the right. housed their own churches, hospitals, and cemeteries. Wars, crusades, plague, famine, and the rise of mendicant monastic orders lead to an unusual gender imbalance in northern Europe in the late 12th century and lasted all through the 13th century. The feudal system defined strict rules for class and gender and there were few options for women. She could live under her father's roof until wed, then live with a husband until widowed, then with a son. The only other choice for an "honest" unmarried woman was to become a nun. However, there were so many unmarried, widowed, or abandoned women in northern Europe, especially in the area we call Belgium, that the religious orders ran out of room and turned women away or required larger and larger contributions before accepting them. The Cistercians even went so far as to close their Order to women for a time. Out of necessity, a new role and lifestyle emerged for unmarried women who were willing to work honestly and live pious lives. They were called beguines (not to be confused with the Latin rhythm with the same name) or "holy women" and they lived together communally, dedicating themselves to God, prayer, and good works, though they didn't take vows or belong to the hierarchy of the Catholic Church. While they were considered laywomen by the Church, in dress, demeanor, and action they appeared to the public as nuns. The name "beguine" may have come from the beige color of their habits, though other theories have been floated regarding their name. The biggest difference between them and nuns was beguines could leave the community to get married with no ill repercussions, but a nun did so only at the risk of excommunication and death. hours in prayer and fasting. At first, homeless women built cabins near each other outside the walls of the towns where they were able to help each other raise children, plant gardens, and sell their handiwork in the market. These ghettos of poor women were easy prey to bandits and worse. The women organized and raised funds to build walls and gates. This naturally gave them a group identity and status. Their walled communities were called begijnhofs or beguinages and some grew so large in the 13th century that they housed thousands of women and were virtual towns with markets, breweries, churches, hospitals, cemeteries, and administration halls. Younger women lived in convent-style apartments and the older or more well-to-do women lived in individual houses. By the end of the century nearly every town in Flanders had at least a small beguinage even if it didn't have a regular convent. Beguines worked hard at many different occupations including such trades as spinning, weaving, and illuminating books. They were not beggars, but did fund-raising and accepted donations for their good work with the poor and infirm. Since this was an age of religion and the women who lived in the beguinages were all Catholic, religion played a big part in their lives. However, due to the preaching of Mary of Oignies, an early adherent of the beguine lifestyle, the beguines were associated with a mystic form of Christian devotion. follower of Mary Oigines until her death. stronghold, and Cardinal of Tesculum. Mary of Oignies came from a wealthy family and was well educated in several languages. She was a contemporary of St. Francis and, like him, was so moved by the suffering of her fellow man that she convinced her husband that they should live in chastity and sell all they had to go and minister to needs of lepers in Nivelles and Liège. According to her biographer and friend, Jacques de Vitry she was a true mystic who practiced severe asceticism and displayed gifts of the "spirit" such as deluges of tears, visions, and ecstasies. When Jacques met Mary she already had a large following and had established the first recorded beguinage. Mary was an evangelist (preacher, missionary) who modeled herself after the women of the early church who lived and preached alongside the other apostles and who "spoke as the spirit gave unction." Vita apostolica, a life of evangelizing, was an important component of the early beguine movement. During the Middle Ages women were not allowed to be priests or preachers, but they were allowed to be prophets. Thus Mary was acceptable to the Church due to her chastity, piety, and visions. She also was one of the first women to ever receive the stigmata (12 years before St. Francis). Mary of Oignies died in 1213. Two years later Pope Honorius III give approval for pious women "to live in communal houses and encourage each other to do good by mutual exhortation." 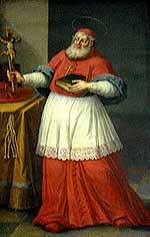 In 1233, Pope Gregory IX formally brought "chase virgines in Teutonia" under Papal protection. 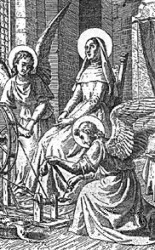 Other famous mystic beguines were Beatrice of Nazareth (1200–1268), Mechthild of Magdeburg (1212 –1282), Hadewijch of Brabant, and Marguerite Porete (d. 1310). They all wrote books in the common tongue about having a personal relationship with Jesus and how it was attainable by all. Beatrice was especially devoted to the Eucharist and demanded to partake of the Mass daily as a way of experiencing the presence and the body of Christ. This was unusual at the time since most people rarely were allowed to participate in the Mass and only watched priests perform the rite from behind a carved wooden partition. Mechthild (Matild) and Hadewijch (Hedwig) saw themselves as weak vessels called to prophesy "because God chooses the weak to confound the strong." According to Abby Stoner, in Sister Between: Gender and the Medieval Beguines, "both women displayed a creativity and freshness of style that reflected their spiritual freedom as Beguines; their sense of self-confidence, divine authority, and personal intimacy with Christ often surpassed that of nuns, yet their contact with the secular world imbued their works with emotional immediacy." Hadewijch wrote of God as Love, which in Flemish is minne, and wrote many allegorical dialogues between Soul and Minne in the style of the courtly love poems of the French troubadours or minnesangers. Since minne is a feminine noun, "under the name of Minne, the Beguine mystics had a powerful feminine metaphor for God (Knuth). Mechthild was the first German mystic on record to have composed her works in the vernacular and thus is considered one of the founders of Die Deutsche Mystik, or German Mysticism. Her visions and dialogues were recorded by her followers in the Flowing Light of the Godhead. By the end of the 13th century, social upheaval lead to widespread religious ferment. Cults, heresies, and offshoot religions sprang up all over Europe. One of these that was often confused with the beguines was the Free Spirit movement. Whereas the beguines spoke of freedom, equality in Christ, and the Holy Spirit, the Free Spirits believed that if one was touched by they Holy Spirit then nothing they did from then on was sin. They could do whatever they willed believing it was encouraged by the Holy Spirit, and therefore couldn't be a sin. The beguines said that a life guided by the Holy Spirit would not be urged to sin. The difference between the doctrines was important but subtle enough to be exploited by those in the clergy that wished to further their careers by persecuting the powerful beguines as heretics. One especially thorny beguine from France was Marguerite Porete. She was pointedly more anti-clerical than her predecessors, claiming to have knowledge of an invisible, ideal church in the spiritual world made up of "free and simple souls" who were called to judge the "little church" established on Earth. Even more troubling was her habit of traveling around Europe, preaching and disseminating pamphlets of excerpts from her book, The Mirror of Simple Souls, and condemning the excesses of the clergy. Marguerite was called before the Inquisition. The friar in charge of her case took parts of The Mirror out of context and sent them to Paris for review. They were declared heretical and she was pronounced a heratic. Marguerite Porete was burned at the stake in 1310. Mechthild and Hadewijch both eventually left their beguinages and joined regular convents to avoid persecution. In 1312, Pope Clement V censured the women "commonly known as Beguines" who took no vows of obedience nor followed an approved rule yet wore a special habit. He went on to accuse them of spreading opinions "contrary to the articles of faith and the sacraments of the Church, leading simple people into error." The authorities began dissolving beguinages all over Europe. The women were either forced to leave and marry, join other approved orders, or suffer Marguerite's fate. In 1318 Pope John XXII allowed that beguines who lived quietly and didn't preach or discourse on the Trinity, could resume their way of life in the beguinages. By 1320 the vita apostolica movement was all but over and the numbers of beguines slipped into steady decline. The beguinages were eventually converted to Catholic convents, universities, old people's homes, and artist colonies. 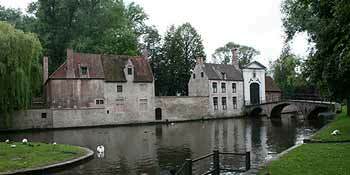 Of 96 Belgium beguinages, 20 still exist and many are now official UNESCO World Heritage sites. The beguines have been called the first women's movement in Christian history and attracted attention from feminist writers in the late 20th century who framed the history of beguines as a gender struggle with misogynistic authority beating down feminine reason. I see a different dynamic at work. Certainly persecution played a part but something more basic than fear halted the spread of the beguine movement. The end of the Crusades, an improving economy, and a temporary gap between major outbreaks of the plague restored the balance in numbers of marriageable men and women. Fewer women turned to a life of chastity in a beguinage because they had more attractive alternatives. Those who were beguines had fewer reasons to stay after their friends and sisters left to marry or passed away. Since the population in the beguinages was not sustained the normal way—by childbearing—evangelizing and proselytizing were the only ways to maintain their numbers. Since theirs was a movement with no vows, rules, constitutions, or commitments—once they stopped preaching and living the vita apostolica—the glue that held it together was gone. However, it left behind a people who believed in freedom of worship and the possibility of a personal relationship with God. This ember of mysticism was not extinguished by the persecution, but continued to smolder in Germany, France, and Belgium until it finally burst into flame as the Protestant Reformation in the 16th century. If you want to add this article to your list of favorites or email it to a friend, please use this permanent URL, https://stores.renstore.com/-strse-template/0808A/Page.bok. Permission is granted by the author to quote from this page or use it in handouts as long as you include a link back to Renstore.com.